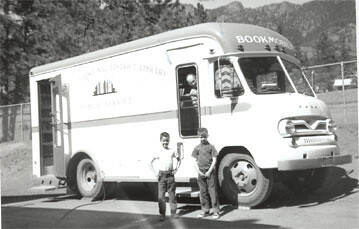 Bookmobile Service began in 1954 when the Pikes Peak Library District was still the Colorado Springs Public Library. The first bookmobile was purchased by a grant from an anonymous foundation. In 1964, two more 28’ (Gerstenslager) bookmobiles were purchased when the Pikes Peak Library District was formed. As more branches were added to the Library District, one of the 1964 bookmobiles was remodeled into a “kidsmobile” for children’s programming and storytelling. In 1980, the 1954 county bookmobile was replaced with a new 30’ (Moroney) bookmobile that had “modern” features such as a fiberglass body, automatic transmission, hot water heat in the floor, and air conditioning. Later, in 1989, the kidsmobile was sold and replaced with a minivan. Soon after, in 1990, a new 30’ (VMCI) city bookmobile was designed and purchased, allowing easier access for senior patrons and replacing the remaining 1964 vehicle. It was equipped with “steps in a drawer” that pulled out from under the vehicle, allowing patrons to navigate the steps first and then open the door while standing on a landing. In 1998, a 32’ (Matthews Specialty Vehicles) bookmobile with a rear diesel engine and a heavy-duty transit bus chassis was purchased to replace the 1980 vehicle for the county bookmobile routes. The added space and custom design greatly improved access for patrons as well as the efficiency of the staff. Bookmobile Service was offered Monday through Thursday until February 2002 when service was expanded to six days a week, Monday through Saturday. This greatly increased the number of underserved patrons bookmobiles could reach. In 2008 PPLD brought two new vehicles to the department, and introduced a new department name. The former Bookmobile Department became Mobile Library Services (MLS). The MLS encompasses the City Mobile Library, the County Mobile Library (formerly known as bookmobiles), and the new Assisted Living “Lobby Stop” service. This new department name better reflects the services offered. The Lobby Stop service is a mobile service via a Dodge Sprinter van, specially equipped with book carts and a hydraulic lift. MLS staff members serve assisted living seniors in the lobby of their facility with bimonthly stops at 15 facilities. The visit includes a 30-minute interactive program designed to spark conversation, discussion, and fun, plus access to Library materials for check out by the residents. This service was partially funded by The Colorado Trust Healthy Aging Initiative, a four year grant. The 1990 city mobile library was replaced with a new 32’ (Mathews Specialty Vehicles) mobile library, similar to the county vehicle, with a diesel rear engine and heavy-duty transit bus chassis. However, this vehicle is equipped with a wheelchair lift making library services accessible to many more patrons. It is also wired for future patron Internet access. All three mobile services are online, allowing staff to review patron records, pay fines, check the catalog for title and subject searches, charge and return materials for patrons, and access the Internet. The city mobile library and the Lobby Stop service use cellular air cards, while the county mobile library uses a satellite, for the “live” connection. The city mobile library serves 25 senior facilities, nine neighborhoods, and one special needs facility for a total of 35 stops. The county mobile library serves eight communities on the eastern plains of the county with 12 stops. The Lobby Stop service provided 287 seniors with 18 programs and circulated 241 Library materials during its inaugural three weeks of service in February 2008. The city and county mobile libraries circulated 223,624 items to 49,299 patrons in 2007. PPLD Mobile Library Services welcome you aboard. We are always happy to serve you!